Real estate major Mary Hendrickson is no stranger to working with mentors. She was assigned to a commercial banker mentor in her real estate career management course for a short-term classroom project. 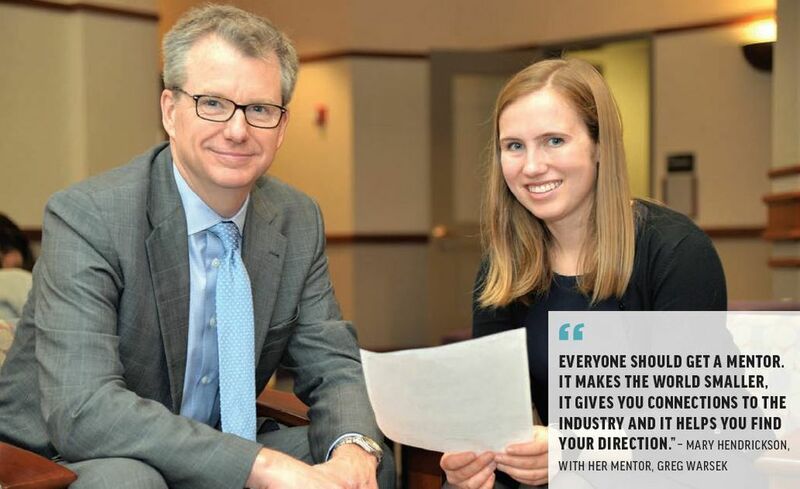 Seeking even more advice about careers outside of the classroom, she jumped at the opportunity offered by Professor Stephen Bell, associate director of The Real Estate Center, to be paired with a second mentor. “I was hoping to get more knowledge about the industry since I was just starting my first internship,” says Hendrickson. Since she was interning in the capital markets group at Jones Lang LaSalle (JLL), a global commercial real estate services firm, Hendrickson was paired with Greg Warsek, group senior vice president at Associated Bank, who manages a commercial real estate loan portfolio. “Greg helped me figure out the grand scheme of what I was doing in my internship. He also helped explain his role in the banking industry, which made my job easier,” Hendrickson says. View the full article on page 15 here.